Al Kaabi Soil & Materials Testing is currently one of the leading testing authorities in Saudi Arabia for soil and construction materials with a service experience of more than 25 years. With high standard operations and professionalism, Al Kaabi Soil & Materials Testing provides field and laboratory quality control services through the testing of soil, aggregate, concrete, asphalt, water and other construction materials. 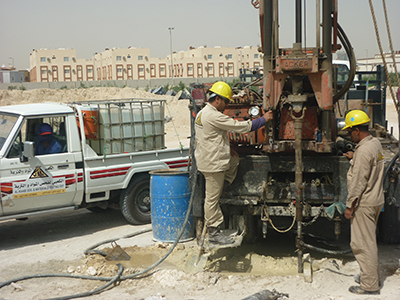 It also offers onshore geotechnical services for both the public and private sectors. Al Kaabi Soil & Materials Testing is listed by many credible and authoritative public and private institutions including the Ministry of Municipal & Rural Affairs, Ministry of Transport, Ministry of Defense & Aviation, Ministry of Education, Saudi ARAMCO, Saudi Electricity Co., the Royal Commission for Jubail and Yanbu, Saudi Telecommunications Co., and many consulting companies. Al Kaabi Soil & Materials Testing is staffed with highly qualified engineers and technicians with strong background experience in soil and materials testing who use a wide range of testing equipment designed to American Standards (ASTM & AASHTO) and British Standards (BS). Geotechnical investigations to determine the physical, chemical and engineering properties of soil which may subsequently be incorporated in structural designs, recommendations and remedial design solutions for weak soil and settlement. Field and laboratory tests on Concrete and the preparation of mix design. Undertakes site inspection and investigations, destructive and non-destructive, invasive and in-situ testing and sampling techniques to enable an accurate assessment of concrete defects and failures. Field and laboratory tests on earthworks and asphalt paving materials, monitoring of asphalt laying, trial mixes and the design of asphalt plants. Chemical Analysis of water for construction purposes, and provides methods of disinfecting potable water mains in the case of newly constructed mains which go through the experience of being removed from service for planned repair or maintenance thereby exposing the pipelines to contamination.